These instuctions are valid for KioWare for Android Version 3.4. Starting with Android 3.7, this feature has been incorporated into the Configuration Tool. This feature will not work for KioWare for Android Versions 3.5 and 3.6. 3. Import the KioWare Configuration for the video player. b. At the top of the screen (upper right of screen), you will select the “Import XML Setting” option. We have included the XML file settings here for you to access. 4. Configure the player with your own content: All content needs to be copied from your desktop or downloaded to your device. a. You will need to provide videos. Videos should be named moviename.mp4 (where “moviename” is your Movie Name) and should go to the folder here: /android/data/com/adsi.kioware.client.mobile.app/embedded. To find that folder, you will open ES File Explorer on your tablet. b. You will need to provide screen shots/still captures of the videos. They should be sized 320x240 and should be named moviename.mp4.poster.jpg (where “moviename” is the corresponding Movie Name). c. Captions for each video can also be provided. The caption file can be created in a .txt file and then should be renamed to moviename.mp4.cap (where “moviename” is the corresponding Movie Name). d. A logo should also be included for use on the start page. It should be approximately 150 x 116 or 192 x 116 – width is adjustable. Download a free demo of KioWare Basic for Android. XML Configuration. Each KioWare deployment includes a configuration file. We are providing the XML configuration for this KioWare Video App deployment along with an addin that makes the XML file work with the Video App. 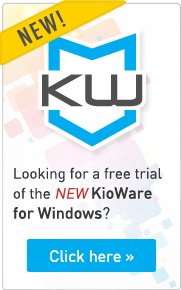 The KioWare Video App (addin) is provided to you by KioWare and is included in the XML file. Included in the addin are sample video and image files to show you where your video and image files should be saved. The videos used in this demo were made available courtesy of Eva Chung. Find more of Eva's videos on her YouTube Channel. Custom brand videos can be requested. You can also set up your Windows device as a video kiosk using KioWare for Windows. View instructions for setting up your device as a Windows video kiosk.